After three games around the North Sea – Explorers, Raiders, and Shipwrights of the North Sea – designer Shem Phillips wanted a change of direction. Literally. So him and co-designer S J Macdonald went to the West Kingdom. The first game in this new trilogy is Architects of the West Kingdom, the sequel Paladins of the West Kingdom was just funded on Kickstarter, we don’t know the title of the third game yet. The West Kingdom is the 9th century Carolingian Empire, and in the first game the players are architects – don’t act surprised now – and construct landmarks and cathedrals for the king. Architects is primarily a worker placement game. When it’s your turn you place one of your workers on one of the board locations and take the action associated with that location. Unlike most worker placement games, where scarcity of workers is a big problem, Architects lets you start with twenty meeples in your employ. Also unlike most worker placement games, you mostly won’t be competing for spots at your location of choice. Most locations have space for an unlimited number of workers. These deviations from the standard formula of worker placement make sense in context of the rules. The benefit of placing a worker increases with the number of workers you already have in that location. For quarry, forest, mines and silversmith that means you take more of the respective resources when placing a worker there. Having more workers at the King’s Storehouse lets you make more trades of those basic resources into more valuable marble or into virtue points. More on those below. At the Workshop you have two options what your workers should do. One, they can get you building plans required to construct those buildings later. Two, they can hire apprentices. Having more workers gives you more apprentices to choose from. Hiring an apprentices gives you a permanent benefit when using their associated locations. Have a woodcutter as an apprentice and you get more wood from the forest every time you go there. Those actions are pretty straightforward and could come from many other worker placement games. The next few actions are more special and form the core of what makes Architects interesting. Even with twenty workers, you’ll want them back at some point. And you might want to stop your opponents from getting ever more resources from their workforce, too. The answer to both problems are the town center and the guardhouse. 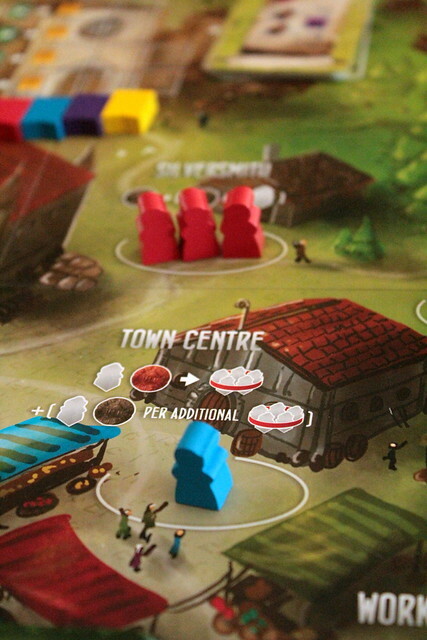 When you place workers in the town center and pay a little silver you may capture all of one players workers from one location. For now, those workers will stay on your player board. More workers in the town center let you do more captures at once. On a later turn you can send a worker to the guardhouse and deliver all those meeple you captured to the prison. The guard will pay a bounty of one silver for each worker delivered. If your own workers are in prison – and they will be, sooner or later – you can send a worker to the guardhouse to release all his colleagues from prison. For free. These are the middle ages, prisons weren’t expected to make a profit yet. 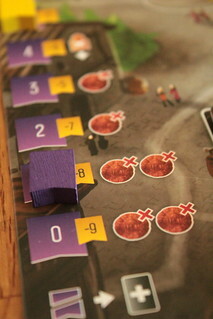 Two more locations, the tax stand and the black market, interact with another interesting mechanism: the virtue track. Actions that cost silver sometimes make you pay part of it as tax. Tax silver goes to the tax stand. You can send a worker to the tax stand to steal the accumulated tax money. That is, obviously, an unvirtuous act, and accordingly you will lose points on the virtue track. The black market lets you buy cheap resources, hire apprentices more easily, or pick building plans from a selection of five. Trading in the black market is not exactly the action of a saint, either, so it also costs you virtue points. Also, your workers in the black market will go to prison sooner or later. Your position on the virtue track limits your options to place workers. Being too virtuous prevents you from visiting the black market. Not being virtuous enough won’t let you contribute to the cathedral, which brings us to the final location, the guildhouse. When you place a worker in the guildhouse you construct a building from a plan you have, or you contribute to the cathedral. 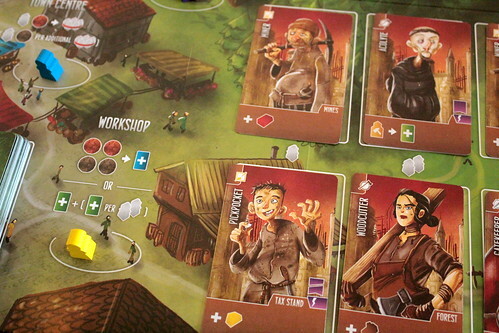 Buildings have a resource cost printed on the card, and may need the right apprentices to be able to construct them. In return, they are worth victory points and either have an immediate effect or a end-game effect for additional points. Contributing to the cathedral also awards victory points, and quite a lot of them. The guildhall is a special location as it controls the speed of the game. Workers placed in the guildhall never come back. Not even through the prison. Building too much too early might leave you with fewer workers than you might want for the rest of the game. However, when the guildhall fills up the game ends, so putting up cheap buildings quickly can really rain on the parade of opponents with longer term plans. In the end, what counts are victory points. You gain those for buildings, cathedral contributions and leftover resources. Your position on the virtue track may give or cost you points. Debt cards and workers in prison cost points as well. And at this point you should have one royal architect. Like I said a few times before, I’m always fascinated by how far a game mechanism can be modified for new games. No one can deny that Architects of the West Kingdom is a worker placement game, but it has an entirely new way for players to interact. The basic cycle of placing workers, having workers captured, rescuing workers from prison means that the other players have some influence over when you get your workers back. You always have ways to get them back on your own, so other players can’t lock you out completely, but those ways are less efficient for you than being captured. Since delivering captured workers to prison is the easiest way to make lots of silver they want to capture workers. You just have to look like a juicier target than everyone else, unless you still want to keep those workers around to get more bang for your next one, in which case you shouldn’t look too juicy. We did have the feeling in some games that twenty workers are too many. You rarely have problems with too few workers, which could have created even more interesting decisions. As is, you do make interesting decisions, but the pressure other worker placement games create through limited workers and limited spaces isn’t quite there. Picking apprentices and buildings to go with your strategy, or a strategy to go with the ones you can get, makes for interesting decisions. Deciding the speed of the game with how many workers you send to the guildhall also has opportunities to try different strategies. For more variety, I recommend the variable setup rules that give each player a special ability and different starting resources. The characters are well balanced and when playing with these rules you really have to play to your characters strengths, another interesting challenge. Like we’ve come to expect from Garphill Games and their international partners, Architects of the West Kingdom has great component quality. The illustrations by Mihajlo “The Mico” Dimitrievski do the rest to make the game look great. All in all, Architects of the West Kingdom is a very solid worker placement game with an interesting new dynamic that we still enjoy after all our test games. 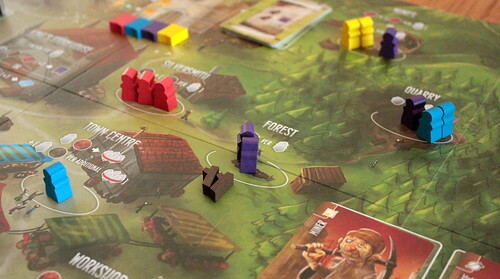 Our first review of a 2016 Essen game is, by necessity, of a light game. We have to play it a couple of times, after all. Futschikato / Fuji Flush, a card game by Friedemann Friese, is as light as any game we ever reviewed, but nevertheless is a really fun game. That’s all thanks to one small twist: low cards can gang up on high cards. No matter how good your card is, you can never feel safe. Ten years ago, you thought spanking the monkey was harmless fun. But you spanked him too hard, too long, too violently and the monkey died. Now, on this night, the money is back from the grave, and he’s out for revenge. And none of the above was a euphemism for anything! When a big secret agency shuts down, many shady people suddenly find themselves unemployed. The Agency was the biggest secret agency there was, and dealing with their leftover agents to make a profit is your job in The Agents. Old Men of the Forest is a charity game: all its profits go to the Orangutan Foundation UK. So don’t think of this as a review, its more a “bringing it to your attention”. You can support the apes – never call them monkeys, they hate that – and gain a light card game in the process.